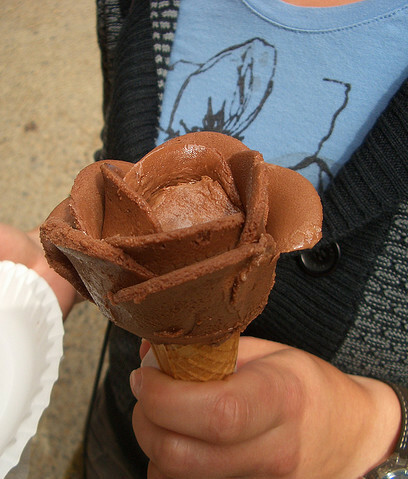 Is it just me or did everyone know that ice cream that has been molded in the shape of a rose is like . . . a thing?? I've heard of rose petals being used to flavor ice cream. I've even seen rose-shaped ice cream as a specialty item and served in a bowl, but never have I scene so much fanciness in a common ice cream cone! I searched and searched for more info on the history of this flowery treat, but couldn't really find anything, other than that it seems like rose-shaped ice cream is usually found in Europe and Asia, which is probably why I haven't seen it! Does anyone have any info on when/where/how this trend started? Wow those look so cool! They are so pretty I wouldn't want to eat it! I'd take a dozen ice cream roses over real ones any day! Stunningly delicious looking, especially the chocolate dipped one! Actually they are not moulded in moulds. In Amorino (http://www.amorino.com/fr/) the sales girls and boys are forming such ice cream roses with just a spoon infront of your eyes. It's really impressive. 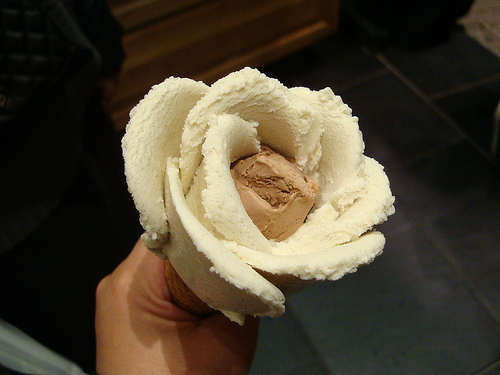 Onse I had a rose formed ice cream and all of the petals had different taste and colour. Delicious. 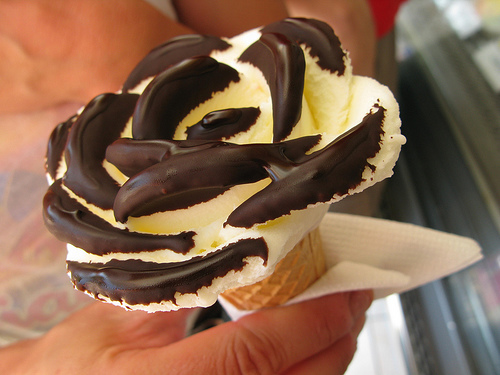 Wow, an ice cream rose with a different flavor on every petal? That is so cool! Thanks for the info, Silvia! These are so neat. Thanks for sharing. I wonder how long it takes for them to scoop it out like that! I have never seen ice cream roses, but now that I have I must have one! what!? love that last chocolate dipped one!! Just came back from Budapest, and saw these ice cream roses for the first time. So fabulous! Just loved them! hot i mean cold as in coooooolllll that it amazing i wanna learn how to do that!!!!!! Hi. According to the comment that Silvia left, they have ice cream roses at Amorino. Their website is listed above.